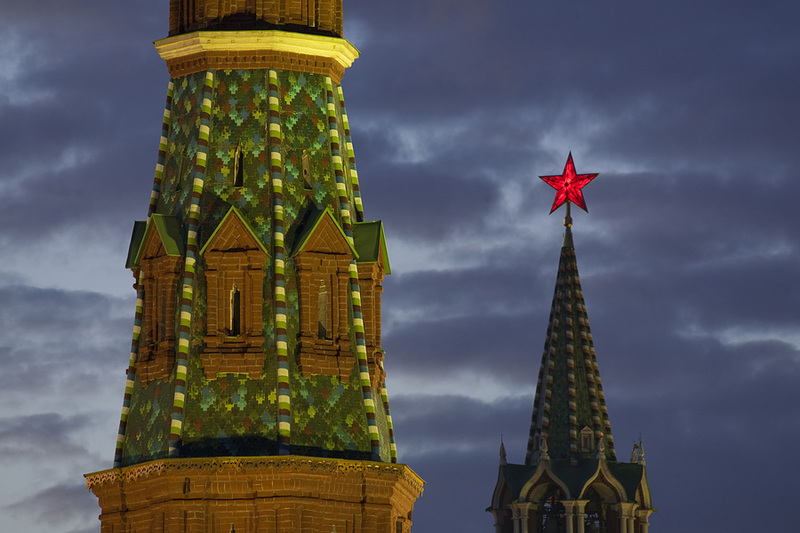 Stars appeared on Kremlin tower not long time ago. 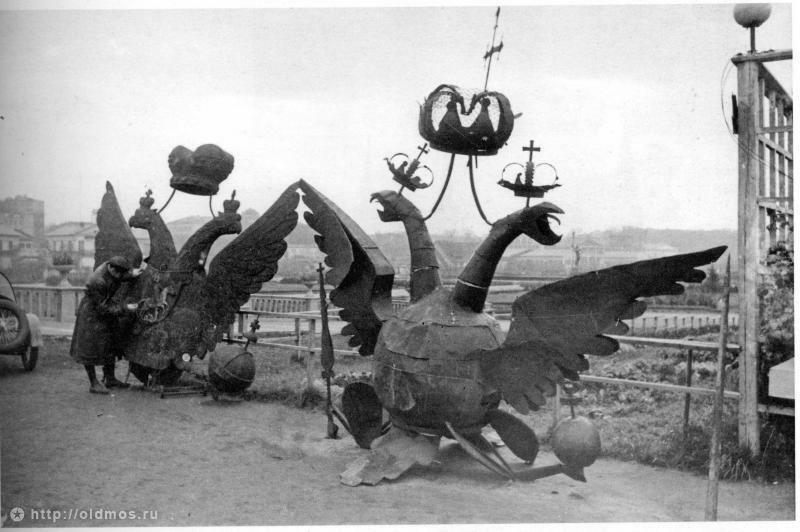 There were golden symbols of tzarism, double eagles, in the center of the country until 1935. 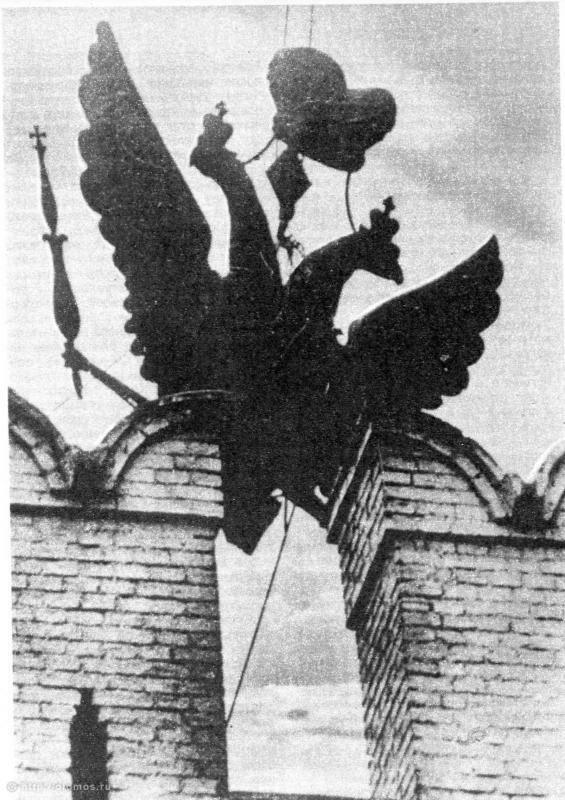 From 1600’s four Kremlin towers(Troitskaya, Spasskaya, Borovitskaya, Nikolskaya) were decorated with Russian state organization symbols – enormous golden double eagles. 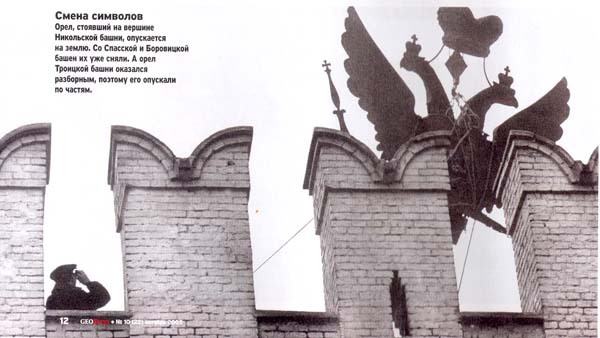 Right after Revolution a question about replacement double eagles on red stars for Kremlin towers arose. But such replacement would cost a lot that’s why it wasn’t done for the first years of the Soviet time. 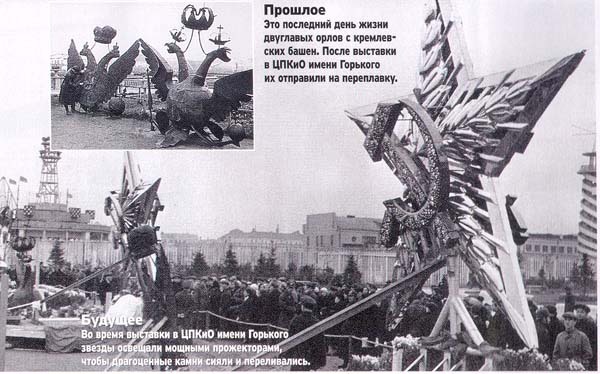 In august 1935 the decision to replace 4 double eagles on red stars by the 7th of November was made. 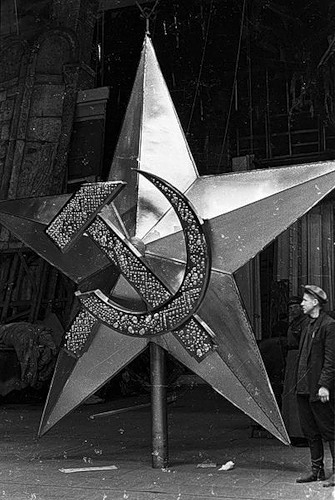 Designing and production of the first Kremlin stars was given to two Moscow plants and the Central Hydrodynamic Institute shop. An outstanding scene-painter F.F.Fedorovsky made the plan of the stars, defining their shape and size. It was decided to make them from high-alloy steel and tough-pitch copper. In the middle of all stars from both sides were supposed to be emblems of sickle and hammer made from gems. When the sketches were done the models of real size were made. Emblems of sickle and hammer were enchased with gem imitation. 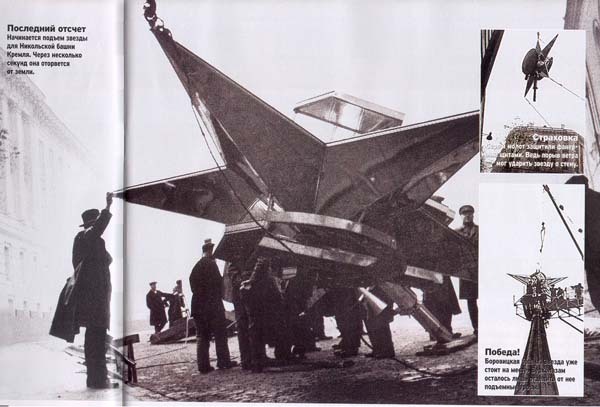 Every model-star was lightened by 12 floodlights, that’s how the real ones were supposed to be lightened in grey days. Party leaders came to see the models and they gave a permission to make the real stars but also to make them to spin so Moscowers and capital guests could see the stars from everywhere. 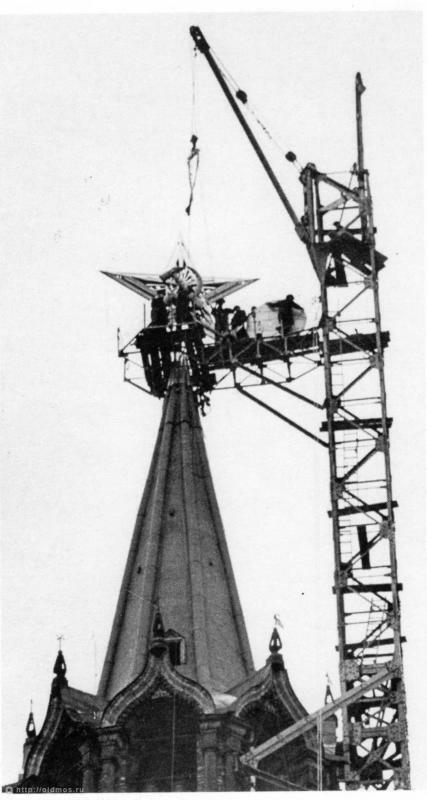 When the star making was completed, another problem appeared, how to raise them on the top of the towers, there weren’t any big cranes at that time yet. 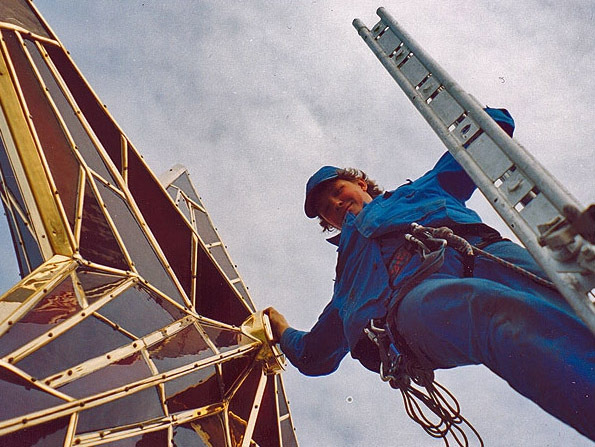 The specialists built the special cranes for each tower with the purpose to set the crane up on the top level of the tower. When everything was ready for installation, it was decided to show the starts to people first. All stars were brought to the Central park of Culture and Rest on the 23d of October 1935 where hundreds of people came to admire their beauty. 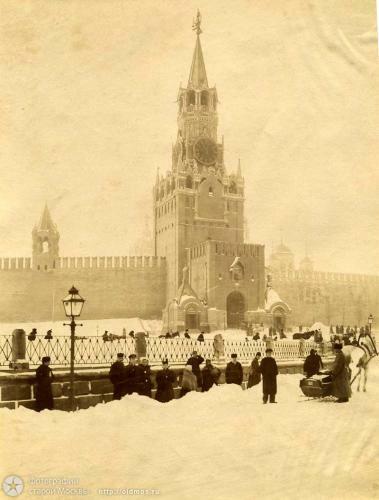 On the 24th of October the first star was installed on the top of Spasskaya tower, later the stars shine out from three other towers. 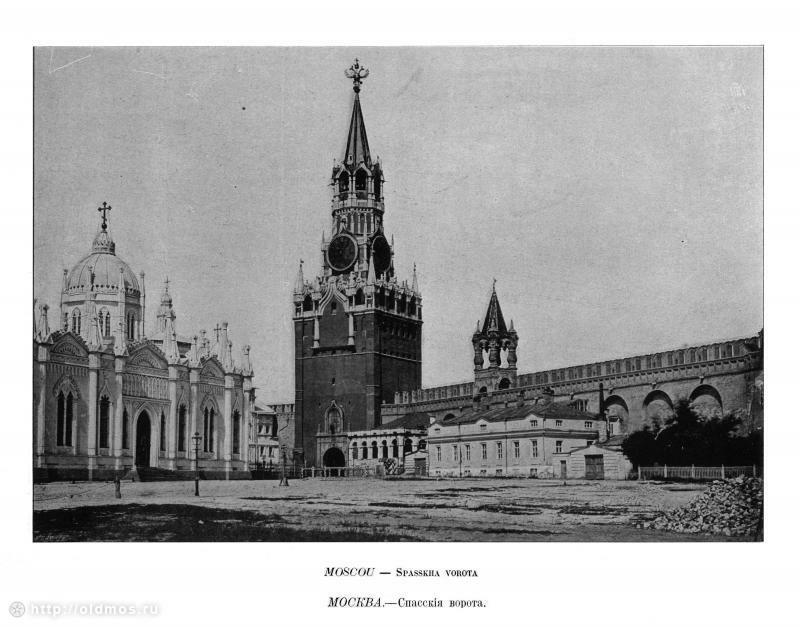 The first stars weren’t on Moscow Kremlin towers for very long. Due to precipitations Ural semi-precious stones grew dim in a year already. 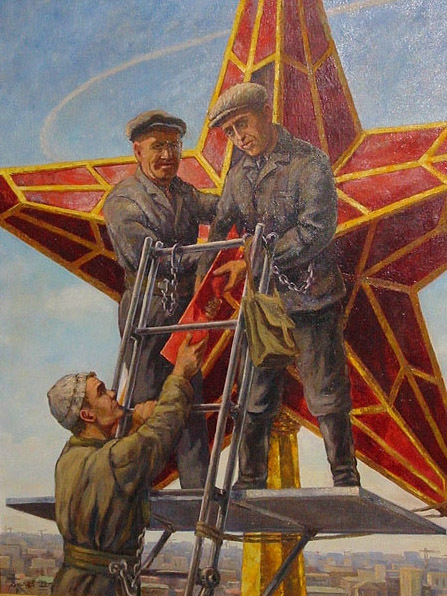 That’s why in May 1937 it was decided to put new shiny, ruby stars. 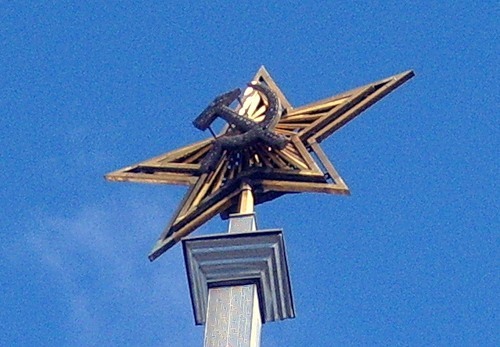 At that time one more, “Vodovzvodnaya”, star was added to the existed ones. 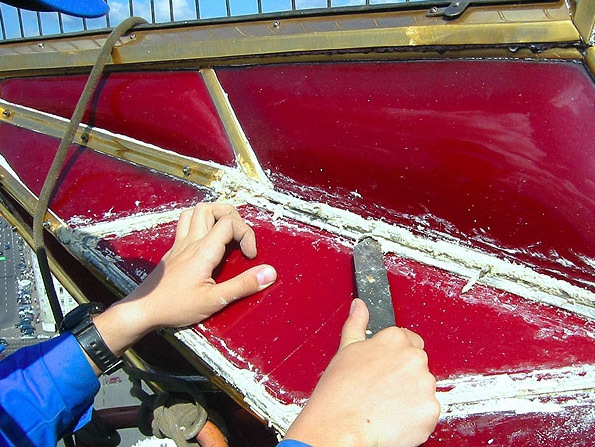 Once in 5 years stars glass is washed by industrial alpinists so they shine brighter. 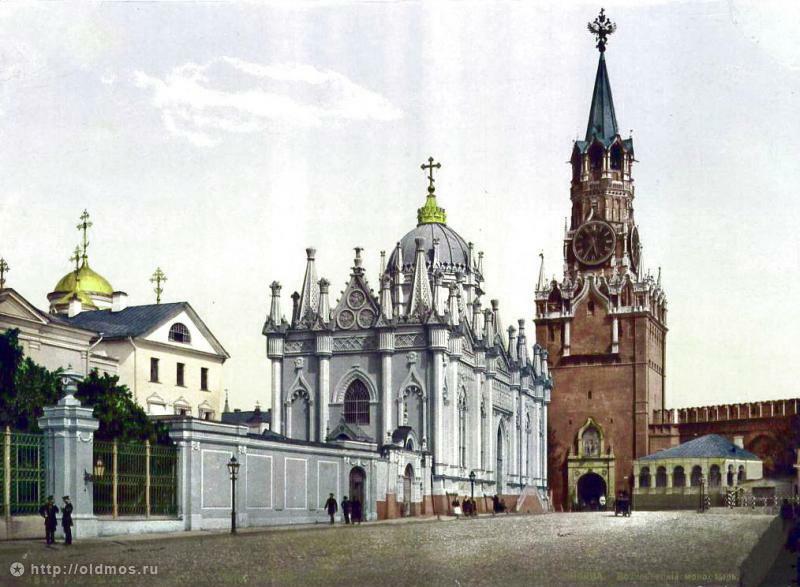 Thank god the Czarist symbols are gone from the Kremlin. There is no god for dirty commies. There is good and bad in everything and not everything of the Soviet Union was bad as some people with their self serving propaganda would have you believe! 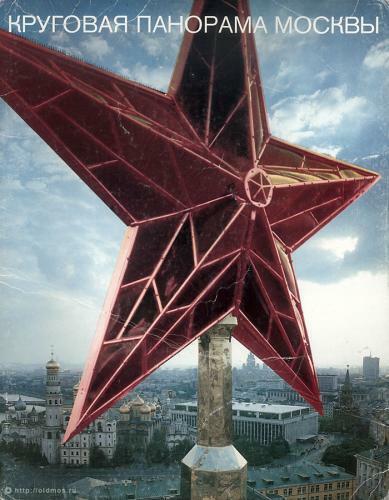 I love the Soviet Star with Hammer and Sickle symbolism! It has takening on a whole new meaning to me now. It brings to mind far more pleasant thoughts than unpleasant ones! But I’m personally not someone who is impressed with nor desires wealth. It is not the symbols of a country that make it good or bad,it is its leaders! What I was talking about is that people do form associations of a country’s symbols with what they have seen or heard of that country. And if the pictures and information is biased and or limited, they likewise have a biased and or limited association with everything about that country! When I was younger, what little I knew of the Soviet Union, Russia wasn’t good at all. 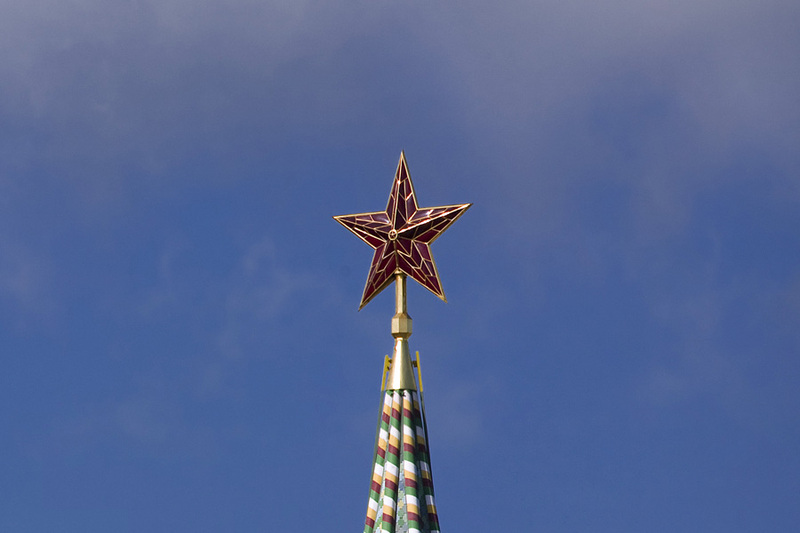 When ever I would see the Soviet star, hammer and sickle, I always thought about the Soviet Union, Russia and what little I knew that wasn’t good. She never said it was! So thats where the rubies came from for my ruby slippers. People’s republic of china #1! So… Communism is over. Are there any plans to replace these?